In other words, they believe that Allah is the Creator, Sustainer, Controller and Provider, but they still worship those idols besides Him! Powerless statues and idols that do not own a single thing; they cannot bring benefit or cause any harm, and they cannot give nor can they withhold. They have no power to do any of these things for themselves, let alone for others. 1- A response. You say “labbayk” to someone who has called and invited you. It in incorrect, linguistically and rationally to respond to to someone who does not speak or call the one who answered him. This affirms the attribute of speech for Allah. 4- Constant humility and submission. 5- Sincerity, the word “al-lubb” is an untarnished, pure essence of something. 6- Affirmation that Allah hears. It is impossible for someone to say “labbayk” to one who cannot hear his response. 7- Drawing near to Allah. 8- It has been designated, while in Ihram, to signify a transfer from one state to another. Similar to Takbeer in Salah which is an indication of changing positions, the Talbiyah indicates switching from one rite to another. For example, the Sunnah is to recite the Talbiyah until beginning Tawaaf and then to stop doing so until he is standing at ‘Arafah and so on. 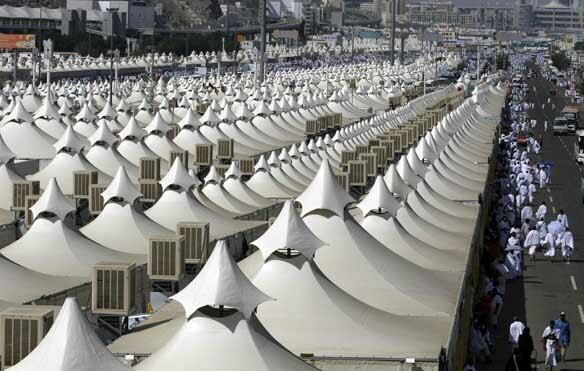 Hence, the Talbiyah is a distinguishing mark of Hajj which is said between moving rites. Once he concludes the rites of Hajj he discontinues the repetition just like the Takbeer is discontinued after he concludes the prayer. 9- A sign of Tawheed, the deen of Ibrahim ‘alayhissalam, which is the essence and the aim of Hajj. 10- It is the key to Jannah, and the gate through which one enters Islam- the declaration of sincerity and testifying that Allah has no partner in worship. 11- Praise for Allah- this is one of the greatest things that brings one closer to Him. 12- Recognition that all blessings and favor is from Allah. 13- Affirming that all dominion belongs to Allah; each and every single thing in this universe is in His control, and that is a consoling belief. 15- There is a rebuttal in the Talbiyah for anyone who denies the attributes of Allah and His Tawheed.